UNESCO Chair Correspondent Br. 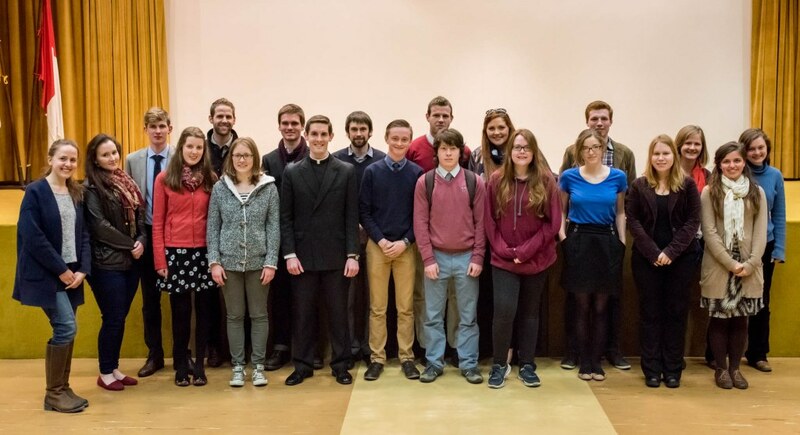 Michael Baggot shared his international Chair experiences with students of the Newman College and Thomas More College Rome programs on March 10. 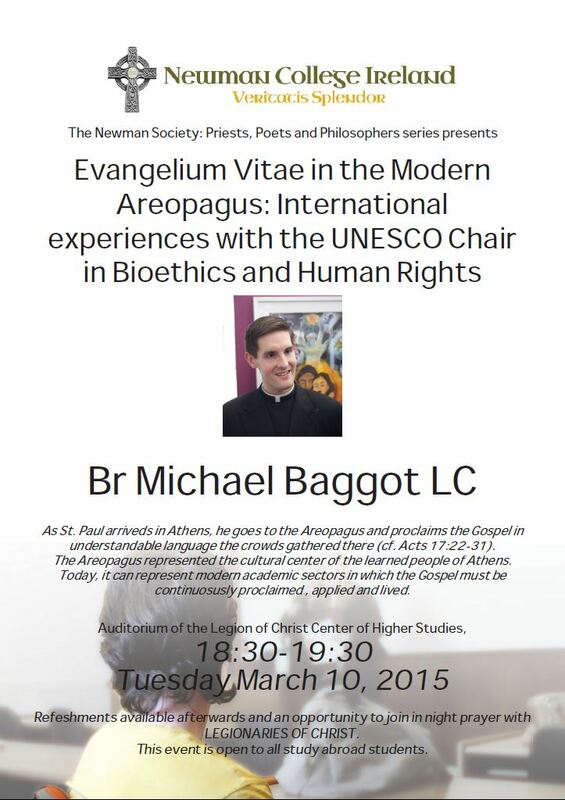 The talk “Evangelium Vitae in the Modern Areopagus” was the latest installment in the Priest, Poets & Philosophers series. Dr. Caitlin Smith Gilson, former Chair of the Philosophy Department at the Pontifical College Josephinum and current Dean of Newman College’s Rome Program, founded the conference series in order to bring interdisciplinary insights to bear upon contemporary concerns. Baggot first highlighted his visit to the New York Headquarters of the United Nations on the occasion of an exhibit of winning pieces from the first Bioethics Art Competition. He then discussed the chair’s work at its base in Rome, highlighting the annual summer bioethics courses that enjoy the presence of thinkers from around the world. 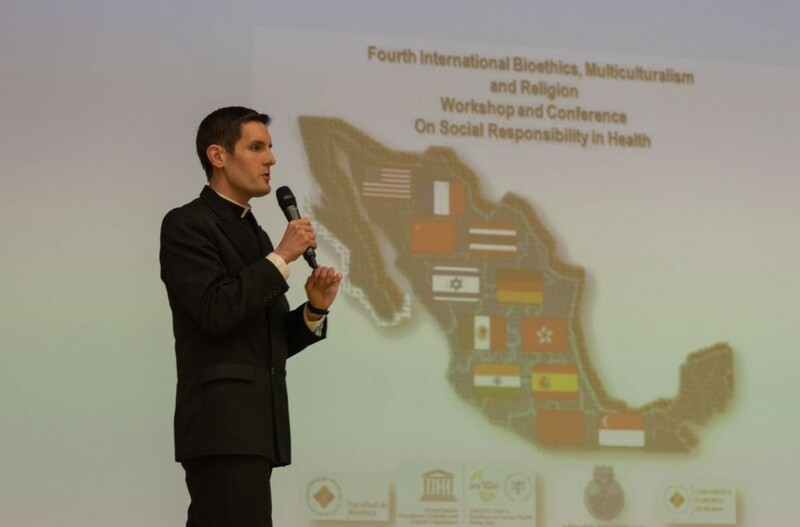 He then explained the Chair’s series of meetings on Bioethics, Multiculturalism and Religion, which was devoted to human rights in Hong Kong and social responsibility in health Mexico City. Sharing these experiences enabled Baggot to reflect upon the nature, challenges and value of interreligious and multicultural dialogue regarding the major issues of global ethics that shape society across the world.